Just like GSIs, Views for N1QL supports a variety of OLTP like use-cases including basic, ad-hoc, and short-running reporting queries that require filtering and aggregations. Auto Partitioning of Indexes: Views come with auto partitioning and smart placement within the data service. Built-in replicas and HA for Indexing: Views come with built in replicas for high availability within the data service including Server Group Awareness support and rebalance support. Simple Scaling Model: Views are automatically placed and scaled with the data service. You can define a primary or secondary index using Views for N1QL using the CREATE INDEX statement and USING VIEW clause. For more information on the syntax and examples, see CREATE INDEX statement. Data nodes hash partition data so that data is uniformly distributed across the cluster. 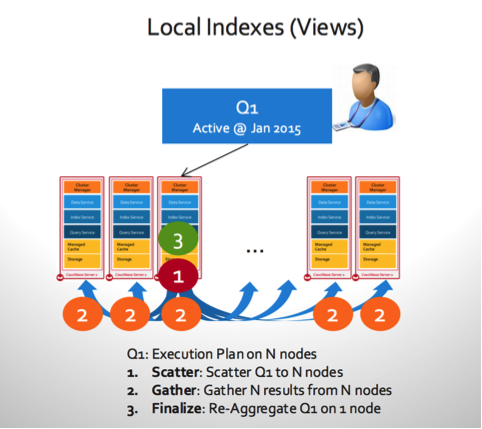 View indexes are co-located with the data and each view index contains only a subset of the data that is available on the node. Views require scatter-gather to execute scans due to its architecture. View is a local index that is placed aligned with data distribution in the data service. request_plus: This scan_consistency flag executes the query but require the indexes to be updated to the logical timestamp of the query request. For example, an application issuing the query may have done its last update 100 ms ago. An application issuing the query with request_plus scan consistency flag takes the logical timestamp of query request. This behavior achieves consistency, at least or later than the moment of the request timestamp. If the view maintenance is running behind the request timestamp, the query waits for the view to catch up to the request timestamp. This consistency option is identical to the stale=false consistency flag used in the View Query API.